AM: Impress Travel team will pick you up from Phnom Penh International Airport to the hotel. 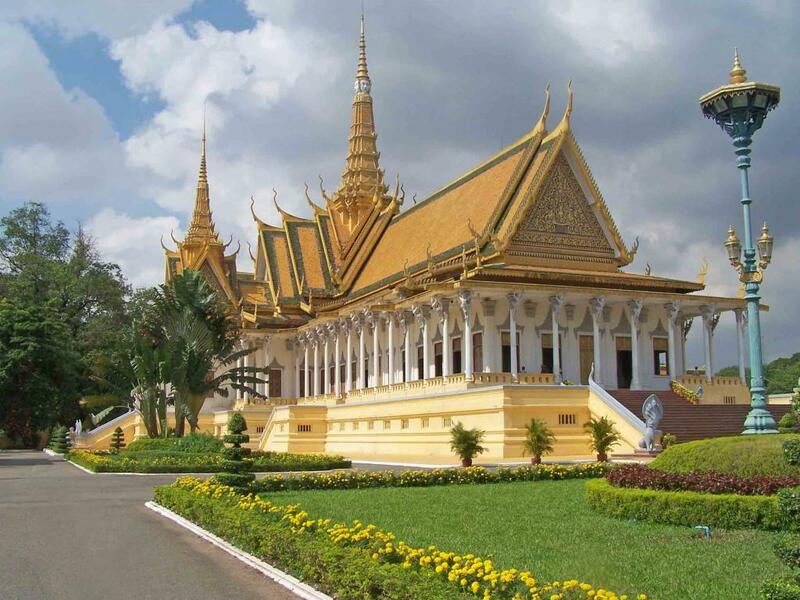 PM:Phnom Penh city tour: Visit the Victory Monument, and the National Museum, also called Musee des Beaux-Arts. A French archaeologist and painter, Georges Groslier, designed it in Khmer style in 1917. The museum contains a collection of Khmer art - notably sculptures - from throughout the ages. Visit the Royal Palace, built by King Norodom in 1866 on the site of the old town, and the Silver Pagoda. Located within the grounds of the Royal Palace, the Silver Pagoda is so named because of its floor, which is made up of 5000 silver tiles. The treasures found inside include a solid gold Buddha encrusted and weighing 90kilograms and a small 17th century emerald and baccarat crystal Buddha. End your afternoon with the visit of the Wat Phnom Temple, Phnom Penh’s namesake, from where you can enjoy views over the tree-lined avenues of the city during sunset. Dinner at local restaurant and accommodation at hotel. AM: After breakfast at hotel. Transfer to Phnom Penh International Airport and departure by Siem Reap Airways International or similar to Siem Reap. Arrive at Siem Reap International Airport and transfer to the hotel (rooms may not ready until the afternoon). PM:Visit Preah Khan, built by the King Jayavarman VII and, like Ta Prohm, a place of towered enclosures and shoulder-hugging corridors. Unlike Ta Prohm, however, the temple of Preah Khan is in a reasonable state of preservation and ongoing restoration efforts should maintain and even improve this situation. Neak Pean, a fountain (built in the middle of a pool and representing the paradisiacal Himalayan mountain-lake), the temple of Ta Som, as well as the unique brick sculptures of Prasat Kravan. Lunch at hotel. Visit the ancient capital of Angkor Thom (12th century). See the South Gate with its huge statues depicting the churning of the ocean of milk, the Royal Enclosure, Phimeanakas, the Elephants Terrace, the Terrace of the Leper King and Bayon Temple (unique for its 54 towers decorated with over 200 smiling faces of Avolokitesvara). Sunset at Pre Rup. Dinner at local restaurant and accommodation at hotel. AM: After breakfast at hotel. Visit the most famous of all the temples on the plain of Angkor: Angkor Wat. The temple complex covers 81 hectares and is comparable in size to the Imperial Palace in Beijing. Its distinctive five towers are emblazoned on the Cambodian flag and the 12th century masterpiece is considered by art historians to be the prime example of classical Khmer art and architecture. Angkor Wat’s five towers symbolize Meru’s five peaks - the enclosed wall represents the mountains at the edge of the world and the surrounding moat, the ocean beyond. PM: Visit Ta Prohm, one of the most beautiful temples in the area. Ta Prohm has been left relatively untouched since it was discovered and retains much of its mystery. Visit also Chau Say Tevoda and Thommanon. Transfer to Siem Reap International Airport for departure flight to the next destination. Trip ends. + Domestic flight Phnom Penh – Seam Riep, economy class including tax.